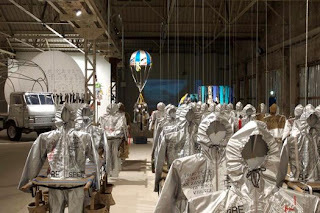 Lucy + Jorge Orta's 'Antarctica' installation at Hangar Bicocca in Milan suggests a utopic realm or safe refuge without borders and the 'equitable distribution of resources' as a new view on 'true globalisation'. 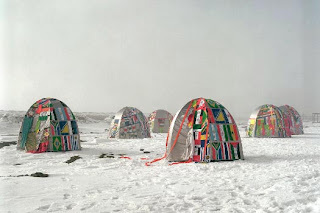 Given that the Antarctic contains 70% of the planet's fresh water reserves and is off limits to military activity, where else should we turn for ideas that might thaw our numbness and paralysis to date? I will thankfully spend Earth Day without a drop parachute or survival kit. Extremes abound but the edges are thankfully overlapping and softening like never before. There is unity as well in the colorful fabrics that flap in the breeze as emblems of what distinguish us. The Land/an art site will be opening its gallery doors for the first time this Friday, April 11th, in Albuquerque, New Mexico. 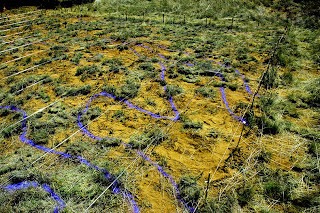 The inaugural exhibit, 34.495N, 106.330W will feature international artists who have recently completed residencies at the 40 acre art and conservation site located near Mountainair, NM. Exhibiting artists include Kathy Bruce (work pictured above), Thomas Cates, Francisco Guevara, Yolanda Gutierrez, J.A. Lee, Alastair Noble (work pictured below), E. Nuevo, and Miriam Sagan. 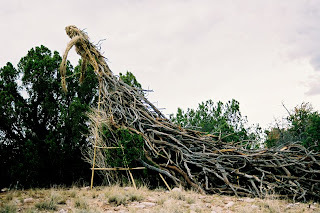 Both the art site itself and the new in-town gallery are part of this New Mexico-based non-profit's mission to promote environmental awareness though a sustained dialogue about art created on the land and for the land via off-the-grid, immersive residencies. 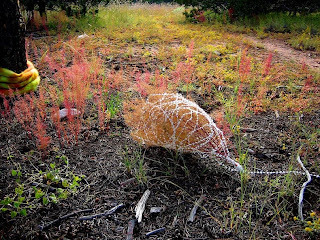 You can read about my transformative 2006 residency at THE LAND/an art site on Landviews.org. Stay tuned for the upcoming 'collaborative' exhibit, Site Unseen, during Fall 2008.